Do you feel a sharp pain along the arch or heel of the foot when you get out of bed in the morning? If so, you probably have plantar fasciitis. Plantar fasciitis affects people who spend long periods of time on their feet, usually on hard surfaces like concrete or asphalt. Most cases affect people between the ages of 40 and 60. 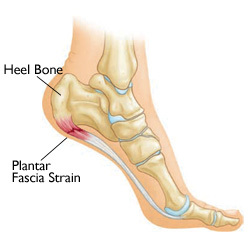 Plantar fasciitis can be caused by foot structure, such as flat or high-arched feet. Shoes without proper support worsen the condition. Tight calve muscles also are usually a factor. Plantar fasciitis affects many runners. “Plantar fasciitis is caused by drastic or sudden increases in mileage, poor foot structure, and inappropriate running shoes, which can overload the plantar fascia, . . . the stress of overuse, overpronation, or overused shoes can rip tiny tears in it, causing pain and inflammation, a.k.a. plantar fasciitis . . . Plantar fasciitis tends to strike those who overtrain, neglect to stretch their calf muscles, or overdo hill work and speedwork,” according to Runners World magazine. It’s very important to pay attention to your pain, “Ignoring plantar fasciitis may result in chronic heel pain that hinders your regular activities. If you change the way you walk to minimize plantar fasciitis pain, you might also develop foot, knee, hip or back problems,” according to the Mayo Clinic. If your foot hurts you will shift weight off of it, onto the other leg. The supporting leg will be under additional stress and will have to work harder, resulting in tighter muscles. Knees and hips will also shift position, affecting the spine and the muscles of the lower back. Pain and tension will flow up your leg into your back unless you do something about it! Most of the pain with plantar fasciitis is caused by tense muscles pulling on the Achilles tendon. Sore points are also found in the calf muscles and arch of the foot. Massage therapy focuses on treating trigger points and releasing the contracted muscles. 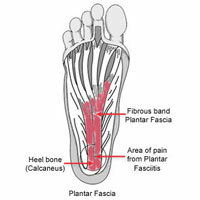 The plantar fascia is also targeted with myofascial techniques to release tension and create space. A recent study confirmed the effectiveness of massage for plantar fasciitis, findings were published in Massage Today. Call Woodstown Massage Boutique, 856-769-1373, to schedule your Plantar Fasciitis treatment today! Self care is also important with this condition, self-massage and stretching should be done every day. Achilles Tendon Stretch: Stand with your affected foot behind your healthy one. Point the toes of the back foot toward the heel of the front foot, and lean into a wall. Bend the front knee and keep the back knee straight, heel firmly planted on the floor. Hold for a count of 10. Plantar Fascia Stretch: Sit down, and place the affected foot across your knee. Using the hand on your affected side, pull your toes back toward your shin until you feel a stretch in your arch. Run your thumb along your foot–you should feel tension. Hold for a count of 10. Plantar fasciitis is a painful condition, but can be helped tremendously with massage and stretching techniques. Call Woodstown Massage Boutique, 856-769-1373 to schedule your pain-relieving session today.